'Planet Syria' campaign aims to rally international organizations and groups to end Assad's regime and begin negotiations between rebels. Syrian civil society groups appealed Tuesday for an international commitment to end the brutal war in their country as the only means to put the brakes on the spread of extremism, AFP reports Tuesday. "Stopping the violence requires two steps which we cannot achieve alone: an end to (President Bashar) al-Assad regime's barrel bombs and air strikes and negotiations between all Syrian groups and their international backers," 85 groups said in an emotive joint campaign. "We have called the campaign 'Planet Syria' because we sometimes feel as if we are from a different planet," said campaign organizer Oula Ramadan. "Our demands for freedom and democracy are treated by many as if they are completely alien and unrecognizable," she said. "Our peaceful uprising has been turned into the world's war ... We need truly global solidarity to end it." Campaign activists said they felt "abandoned" by an international community preoccupied with extremism rather than the war's daily horrors. "We are deeply frustrated by the lack of support from our friends around the world," said another organizer, Salma Kahale. 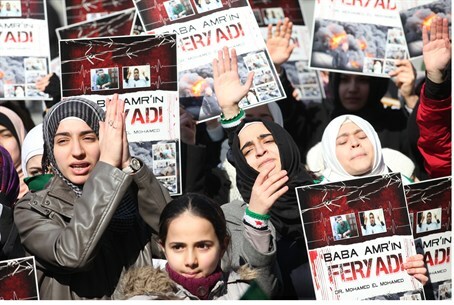 Syria's civil war began in March 2011 with peaceful demonstrations, but the protests have been drowned out by a brutal regime crackdown and the barbarity of jihadist organizations like the Islamic State group. The civil society groups attributed the rise in extremism to continuing indiscriminate violence, particularly barrel bomb attacks which Damascus has been widely accused of carrying out on rebel-held areas despite its denials. "With every home they destroy, more people are radicalized, turning their backs on more moderate paths towards justice," they warned. "Extremism grows from the rubble of our ravaged towns and cities, and will only continue to expand unless we act together," they said. "To stop the extremism we have to end the bloodshed in Syria." The signatory groups represent civilians across Syria and include unions, women's collectives and nonviolent activist groups like the Violations Documentation Centre (VDC), the Syrian Network for Human Rights (SNHR) and the Kurdish Women's Union.